Write Sense Media » What band leader edited this? After Jo Fletcher Books’ wonderful ‘What builder edited this, then?’ blog last month, imagining how a somewhat crotchety builder might deal with editing a less than satisfactory manuscript, I was inspired to imagine my own profession-crossing scenario. I spent a short stint a couple of years ago singing with a local big band. I’ve never really got the hang of sight-reading sheet music, and I was more than a little daunted by the deafening sound of assorted trumpets, trombones and saxophones blasting out a rousing rendition of the Family Guy theme tune. I managed to get a couple of gigs under my belt nonetheless – one particularly proud moment in front of the historic Pittville Pump Rooms in Cheltenham – but I can still remember the band leader’s incredulous remarks to me on the many occasions I sang the wrong note or came in two bars early. And so this blog, just for fun, is in tribute to my erstwhile, exasperated band leader. How would he edit my manuscript? “Right, we want to start with this first sentence and just completely redo it. It’s the first thing your audience reads: you’ve got to get it right. “Oh no. Hang on. You can’t have this. What did I tell you about mixing up your n dashes and m dashes? You’ve got to start using them correctly or you’re just going to come across as unprofessional. “Why am I hearing clichéd descriptions of this character’s face when I should be finding out what they’re doing – what they’re up to? Let’s have some action in here, yeah? “I tell writers this all the time and they never seem to listen. Why are you hyphenating all those adverbial phrases? Does the hyphen need to be there? Can you live without it? Yes? Then do. “Look, it’s all about consistency. You can’t decide to call this character Fatima, then in the next chapter change her name to Latima. Your audience will never follow you. You’ll leave them languishing in the first chapter, not knowing where on earth you’ve gone to. “No, no, no. Stop. No, just stop the whole thing. We can’t keep it going like this. It’s too dreary. You’ve got to give it some more umph. Are you trying to bore your audience with all that tedious background filler? Cos I tell you, if you’re trying to do that, it’s working. “Okay, I know there’s a fashion these days for commas to go AWOL for no particular reason (laziness, that’s all I can figure). But you’ve got to understand that these words need punctuating. Like I say, your audience won’t be able to follow you. They don’t know whether you’re coming or going. We need a couple here and here – and here and here. It’s only logical. “What I’m wondering is why you’re trailing off so weakly in this final paragraph. Yes, it’s the end of that section, but finish it with feeling! You’ve got to keep up the energy right up to the last word. 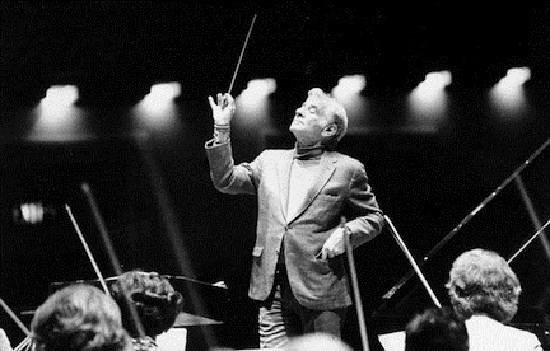 Photo of Leonard Bernstein from The Well-Tempered Ear.